The High-Definition Multimedia Interface Consumer Electronics Control (HDMI-CEC) standard allows mulitmedia consumer products to communicate and exchange information with each other. HDMI-CEC supports many features, like Remote Control Passthrough and System Audio Control, but one of the most popular is One Touch Play. One Touch Play lets a media source device turn on the TV and switch its input port automatically, so you don’t have to search for the TV remote to switch from your Chromecast to Blu-ray player. Most manufacturers have adopted HDMI-CEC so their devices work with other companies’ devices. But because each manufacturer implements the HDMI-CEC standard in different ways, devices don’t always understand each other and supported features vary between devices. Because of this variance, consumers can’t safely assume that two products that claim CEC support are completely compatible. 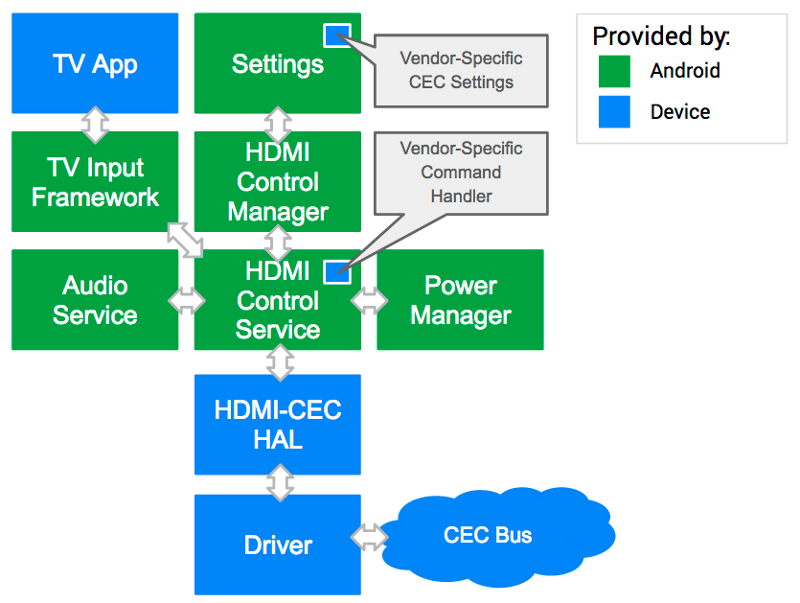 With the introduction of the Android TV Input Framework (TIF), HDMI-CEC brings together all connected devices and minimizes compatibility issues. Android has created a system service called HdmiControlService to alleviate these pain points. A standard implementation of HDMI-CEC for all manufacturers, which will reduce device incompatibility. Previously, manufacturers had to develop their own implementations of HDMI-CEC or use third-party solutions. A service that is well-tested against numerous HDMI-CEC devices already in the market. Android has been conducting rigorous research on compatibility issues found among the products and collecting useful advice from device implementers experienced in the technology. The CEC service is designed to keep a healthy balance between the standard and modifications to that standard so that it works with the products that people already use. HdmiControlService is connected with the rest of the system like TV Input Framework (TIF), Audio service, and Power service to implement the various features the standard specifies. See the following diagram for a depiction of the switch from a custom CEC controller to an implementation of the simpler HDMI-CEC hardware abstraction layer (HAL). See the following diagram for a detailed view of the HDMI control service. A manager class HdmiControlManager provides privileged apps with the API. System services like TV Input Manager service and Audio service can grab the service directly. The service is designed to allow hosting more than one type of logical device. HDMI-CEC is connected with the hardware via a hardware abstraction layer (HAL) to simplify handling differences of the protocol and signalling mechanisms between the devices. The HAL definition is available for device manufacturers to use to implement the HAL layer. Note: Device manufacturers should add the following line into PRODUCT_COPY_FILES in device.mk. Depending on whether your device is a HDMI sink device or a HDMI source device, device manufacturers need to set ro.hdmi.device_type in device.mk for HdmiControlService to work correctly. A device manufacturer-provided proprietary CEC controller cannot coexist with HdmiControlService. It must be disabled or removed. Common requirements for this come from the need to handle manufacturer-specific commands. The manufacturer-specific command handler should be incorporated into the service by extending/modifying it. This work is left to the device manufacturer and not specified by Android. Note that any change made in the service for manufacturer-specific commands must not interfere with the way standard commands are handled or the device will not be Android compatible. Access to the HDMI-CEC service is guarded with the protection level SignatureOrSystem. Only system components or the apps placed in /system/priv-app can access the service. This is to protect the service from abuse by apps with malicious intent. Android supports type TV/Display(0) and playback device(4), which can issue the One Touch Play command to display. The other types (tuner and recorder) are currently not supported. In order to have the service in action, the HDMI-CEC HAL needs to be implemented to the definition provided by Android. It abstracts differences in the hardware level and exposes the primitive operations (allocate/read/write, etc.) to the upper layer through API. * HDMI-CEC HAL interface definition. * pointer in contexts where it's known the hw_device_t references a hdmi_cec_device. * as many times as necessary in order to support multiple logical devices. * (*clear_logical_address)() tells HAL to reset all the logical addresses. * the state back to the beginning. * address is written to addr. * to get the updated address when hot plug event takes place. * (*send_message)() transmits HDMI-CEC message to other HDMI device. * so as not to wait forever for the message to get sent out. * It should try retransmission at least once as specified in the standard. * can later use for incoming CEC messages or internal HDMI events. * When calling from C++, use the argument arg to pass the calling object. * (*get_version)() returns the CEC version supported by underlying hardware. * (*get_port_info)() returns the hdmi port information of underlying hardware. * HDMI ports in the system. * update in HAL itself, firmware or microcontroller. * or 0 to stop it. * (*is_connected)() returns the connection status of the specified port. * Returns HDMI_CONNECTED if a device is connected, otherwise HDMI_NOT_CONNECTED. * The HAL should watch for +5V power signal to determine the status. The API lets the service make use of the hardware resource to send/receive HDMI-CEC commands, configure necessary settings, and (optionally) communicate with the microprocessor in the underlying platform that will take over the CEC control while the Android system is in standby mode. Device manufacturers must test the APIs of the HDMI-CEC HAL with their own tools to make sure they provide expected functionality.